I know it’s not always the best idea to be political on blogs. Why alienate your readership? Even so, I’m going to break that rule. That’s because today, I found politics not to be divisive, but to be hopeful. Today, I went canvassing. Our older two children stayed with my husband. It was me and the baby in a red cherry hat. We leafleted, and as my fingers reddened from pushing at stubborn letterboxes, and my feet wearied, I found myself grateful for postmen and the hard miles they cover. 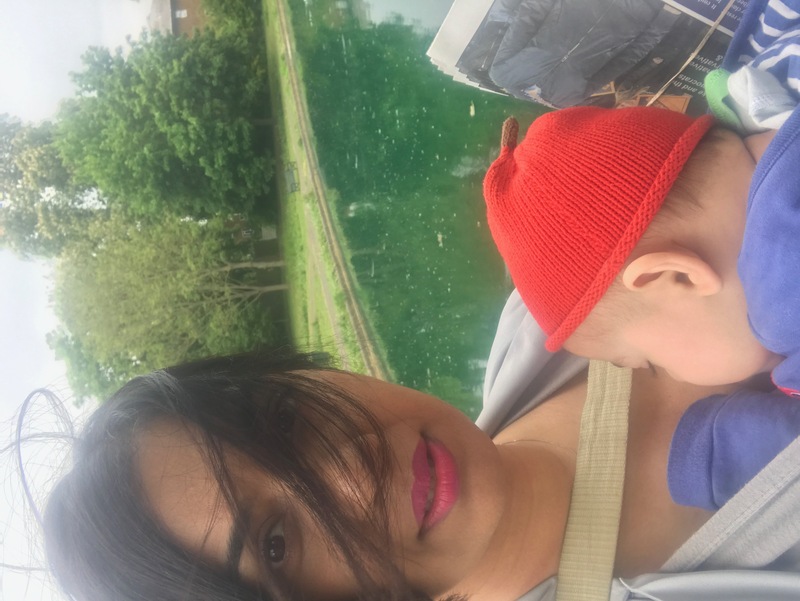 I walked, and we talked to voters, and the baby slept and sometimes woke and looked around until the rhythm of my steps or my voice lulled him back to sleep. It was peaceful. I didn’t expect to enjoy it, but it was one of the most interesting things I’ve done in a while. It alleviated the cloud of helplessness that’s been hanging over me. It’s such a simple thing, being active in your local community. It takes so little time to feel connection. A simple gesture. Eye contact, a smile, a compliment. Walking is still the best way to uncover hidden nooks and crannies. I discovered pockets in our town I never knew existed. Little cul de sacs tucked away from the rush, where the kids in neighbouring houses play on the street together, more siblings than strangers. Chocolate box houses and grand nursing homes that made me think of Great Expectations. Peeling front doors and freshly planted peonies. Clanking dishes and fussing babies. Lost footballs and gnomes in sunglasses. It’s been a while since I’ve really looked into the faces of strangers and sought to understand them. I’ve been too focused on my immediate needs, on home and our family, on work. On the waves of despair that rush at me when the news brings another unwanted headline. And we forget, how the people we live side by side with experience joy and struggles, perhaps in different ways to us. So we walked and discovered inch by inch. Dangerous dog signs and suspicious glances. Still waterways filled with sludge and lilies. Social housing where the halls echo with silence. A woman with her head in her hands on the kitchen table because she thought no one could see. Lonely people. Smiling people opening the door to save my fingers from the teeth of their letterboxes. Personalities imprinted on stamp-sized front gardens, under neighbouring patches of sky. A doctor, running out in his underwear, to talk to me about changing the world. The call of birds and the hum of traffic. The whisper of trees and sore feet. A curious child greeting us from behind his grandmother’s frock. We got home and I took the baby out of his sling. My shoulders ached and we heard about the outcome of the French election, and I thought how it had been a perfect day. I slept more soundly than I have for months. At its best, politics is about understanding people, and about bringing them comfort. Today it reminded me of what it is to be human, and how empowering it is to act out our beliefs, even when the world feels dark. Especially then. Beautifully written as always. Really enjoyed reading and felt I was there too. Thank you. Yes, beautifully written. I can see you with your little one in his sling. Nothing to make people more willing to take in your message than a baby! He’ll enjoy hearing about this when he’s older. I stay politically active in many ways. After my husband died in June 2008, a friend asked me to drive to Pennsylvania with her to canvas house-to-house in support of Obama. It was one of the most healing I could have done.